The side of the color wheel that is comprised of reds, yellows, oranges, and yellow-greens, along with various other combinations of these colors, are typically referred to as the warm colors. These colors have been known to increase adrenaline and breathing rate, raise blood pressure and body temperature, thus making you feel warmer. The stronger the color is, the more intense this “warming” effect tends to be. Warm colors often remind one of sunlight, sand, fire, and heat. Since warm colors often add “personality” to a space, they are perfect for adding interest to bland rooms and balance well with neutral colors. Warm colors often appear as though they come closer, or advance in a space. These colors can make large rooms appear cozier and more intimate or make north-facing or dark rooms appear lighter and warmer. Since warm colors tend to be energizing, you may not want to use a bold warm color as your dominant color in a bedroom, dining room or another area where you want to avoid stimulation. Warm colors often work well with a more traditional decorating style. If this is your style, try using muted, warm tones as your dominant colors. If your color scheme leans heavily toward large amounts of warm colors, try balancing the color palette with a cool color or two. To make the best choices, choose colors on opposite ends of the color wheel. For example, balance a sunny yellow with a soft lilac or deep purple. Though we often want to feel excited and energized in our homes, a bright warm color palette may not work well if you have a more subdued or introverted personality. If this describes you, try incorporating warm colors as accent colors and go with a cooler, softer shade as your dominant color. Whites, blacks, grays, and other neutral tones work well in a warm color scheme, and depending upon the undertones of the color, these neutral colors can appear warm or cool. 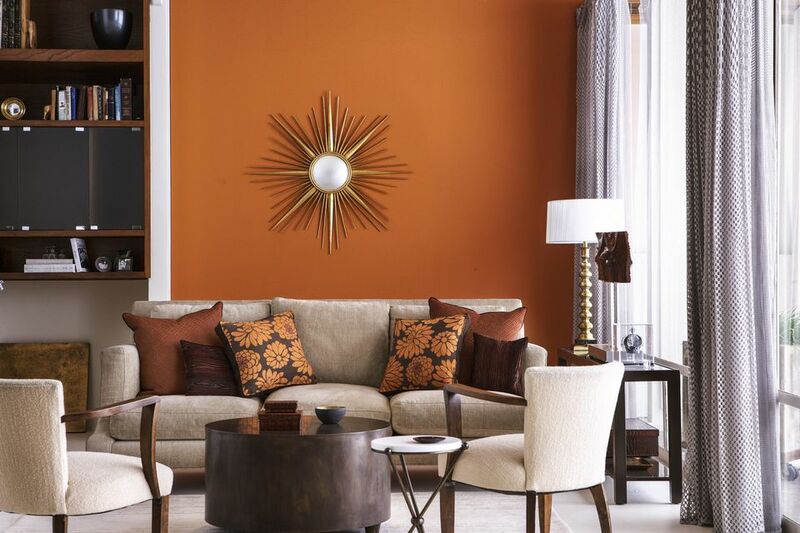 A warm neutral can make an excellent wall color and balances cooler tones like blues, greens or cool reds. When choosing warm paint colors, paint pigments can have subtle variations that can appear differently in your home than in the store. Paints with yellow or muted undertones typically appear warm, but it is worth the small amount of money a paint sample may cost to make sure the paint color works in your home. Remember that when working with color, the decorating color “rules” mentioned above are really just guidelines and can change depending upon various elements such as the lighting or design of the space.